I help B2B service providers and consulting firms generate more leads with persuasive content and strategy. Discover these 10 Steps to Creating a Great B2B Lead Magnet. Stop wasting money on paid traffic. 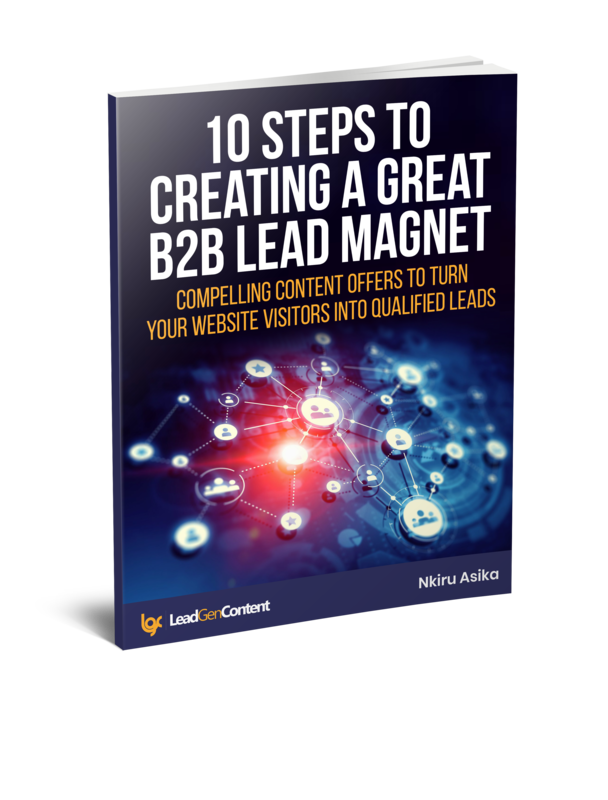 Convert your website visitors into real leads using powerful lead magnets. What do I bring to the table? 20+ years in content as an award-winning journalist, TV producer and strategic communications consultant. As a B2B service professional or consultant, your clients expect you to be an expert. Your qualifications and experience are not enough to make you stand out from the crowd. What gives you an edge is your ability to tap into the needs, concerns and desires of your target audience. And then to position your service as the solution. No doubt, you work hard to meet client expectations. But you will get beaten out by competitors with better marketing (which really means better content), specifically those who have a defined process to convert online prospects into leads. reposition yourself from just another vendor selling services, to a trusted expert selling value. I will help you generate more leads with optimized, audience-relevant content and thought leadership to elevate your brand. If you're ready to raise your game and stake your claim as a go-to person in your industry, then I'm ready with the copywriting, content marketing and strategy to get you there. To chat about how we can work together, book your free discovery call below. Your content should be a rainmaker –bringing in business in the form of leads and sales. As a B2B service professional or consultant, you work hard to deliver a superior service or product. But you will get beat out by those who have better marketing (which really means better content), and a defined process to convert online prospects into leads. I will also work with you to generate more leads by using thought leadership to elevate your brand. If you're ready to raise your game and stake your claim as a go-to person in your industry, then I'm ready with the copywriting, content marketing and strategy to get you there. Effective thought-leadership is not about how smart you come across. It is about how much value you create for your potential customers by delivering content that focuses on their needs, issues and concerns. Content that looks or sounds great but doesn't lead to conversions, is occupying valuable real estate on your website. Is your copy positioned to be seen? Is it primed to convert? I will drive traffic to your website and landing pages with copywriting that both reads well and scores high in terms of search engine optimization. As a B2B marketer it’s an ongoing challenge to get the right content to the right people. Let’s deep-dive into strategy especially around brand positioning (key message platform) and customer intelligence (customer conversations, buyer personas and customer experience of your brand). I can also perform a website content audit to make sure that your website is delivering the returns that it should be. Step up your lead generation game with my value-packed emails. Copyright u00a9 2018 LeadGenContent.com All rights reserved. Need Great Content Tips & Strategies to Generate More Leads? Got traffic but zero leads? Start converting website visitors into real leads using this simple step by step guide! If you'd like to work with me. Feel free to send me a message or book a free consultation by clicking below.